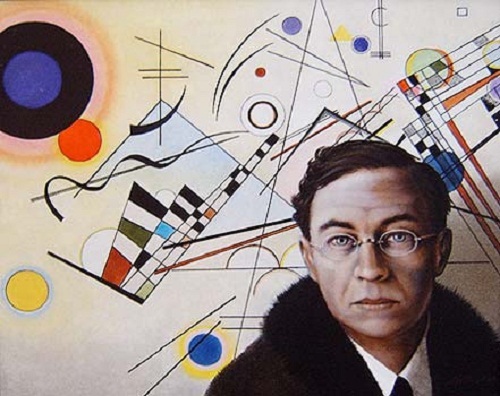 Wassily Kandinsky was a Russian painter and art theorist – that means he studied and wrote about what elements are important within a work of art. He is credited with being the first to paint a purely abstract painting. Our painting of the week is known by its German title, Mit und Gegen, or With and Against, and it is definitely an abstract painting. Kandinsky was a member of the law profession in Russia until he began painting at the age of 30. One event that influenced his abrupt career change was seeing an exhibition of French Impressionists in Moscow. 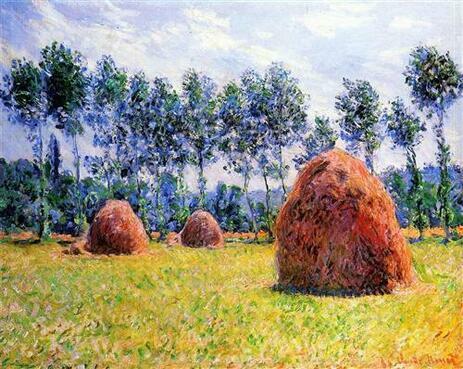 Kandinsky was especially inspired by Claude Monet's Haystacks at Giverny. Kandinsky chose to abandon his law career and move to Munich, Germany to devote himself full-time to the study of art. One of his most important paintings from his earlier painting years was The Blue Rider, which shows a small cloaked figure on a speeding horse rushing through a rocky meadow. The rider is shown more as a series of colors than in detail. Kandinsky later taught at the Bauhaus school of art and architecture from 1922 until the Nazis closed it in 1933. Nazis officers and Germans viewing the Degenerate Exhibit. Hitler labeled modern artists as "incompetents, cheats and madmen" and said there would be no place for modern art in the Nazi regime. The Nazis confiscated some of Kandinsky’s paintings and those of other modern artists, such as Chagall. 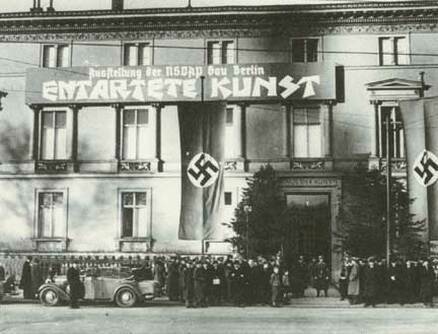 These confiscated artworks were displayed in an exhibit the Nazis called, “Degenerate Art”. Kandinsky moved to France, where he lived for the rest of his life, becoming a French citizen and producing some of his most prominent art. In 1910, Kandinsky painted the first piece of abstract art, which was done in watercolor. In traditional art, an image or symbol is drawn that represents something or someone. That drawing is supposed to make the viewer think of a particular object or person. For example, in Chagall’s work last week, we could recognize a goat or a man even though it might be blue and floating in the sky. Kandinsky’s art did not try to represent objects. Abstract art does not depict a person, place or thing in the natural world -- even in a distorted or exaggerated way. The purpose or subject of the work is based just on what you see: color, shapes, brushstrokes, size, scale, and, in some cases, the process. Kandinsky was the first to realize a work of art could be beautiful or worthwhile without representing something. His works are simply compositions with shapes and colors that have harmony and structure. 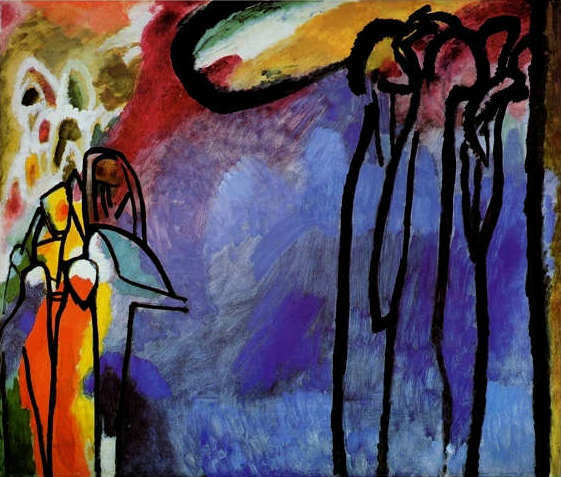 Kandinsky believed that colors produce emotions. Red was lively and confident; Green was peaceful with inner strength; Blue was deep and supernatural; Yellow could be warm, exciting, or even disturbing; and White seemed silent but full of possibilities. A second event had a deep influence on Kandinsky’s desire to paint besides seeing Monet’s haystack painting. It was hearing Richard Wagner’s music of Lohengrin performed at a Russian theater. Kandinsky drew inspiration from the music, which he realized suggested emotion and stirred imagination even though it couldn’t directly represent figures or landscapes due to its abstract nature. Music was important to the birth of abstract art. Kandinsky sometimes used musical terms to identify his works; he called his most spontaneous paintings "improvisations" and described more elaborate works as "compositions." He also assigned instrument tones to go with each color: Red sounded like a trumpet; Green sounded like a middle-position violin; Light Blue sounded like flute; Dark Blue sounded like a cello, Yellow sounded like a fanfare of trumpets; and White sounded like the pause in a harmonious melody. Kandinsky’s abstract art altered the world of art and helped begin its modern age. In 2012, one of his paintings, Study for Improvisation 8, was auctioned for $23 million. In 2014, Google honored Kandinsky on what would’ve been his 148th birthday by featuring a Google Doodle based on his paintings.